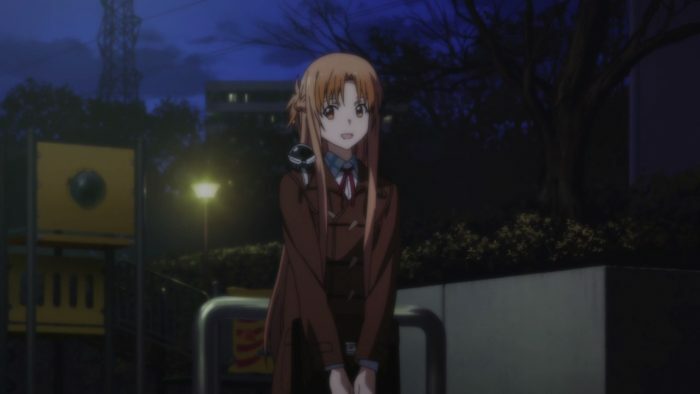 In the last episode, Yuuki told Asuna that her wish is to attend school. With Kirito’s help, Asuna is making that wish comes true. 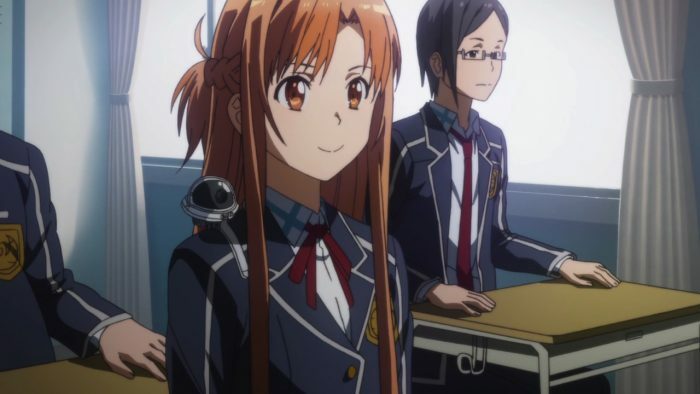 Yuuki is attending Asuna’s school through a camera attached to Asuna’s shoulder. 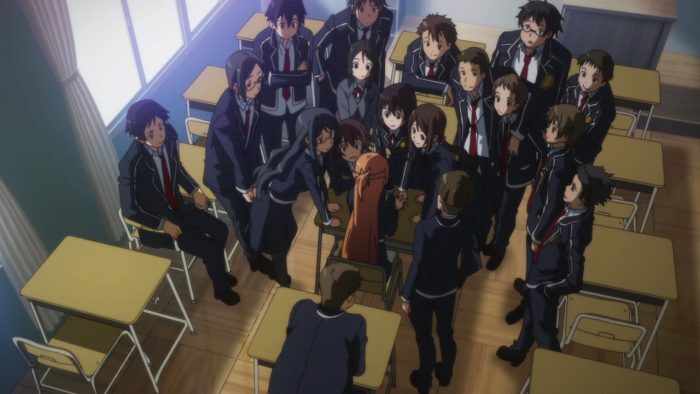 Surprisingly, all her classmates accept Yuuki very positively. 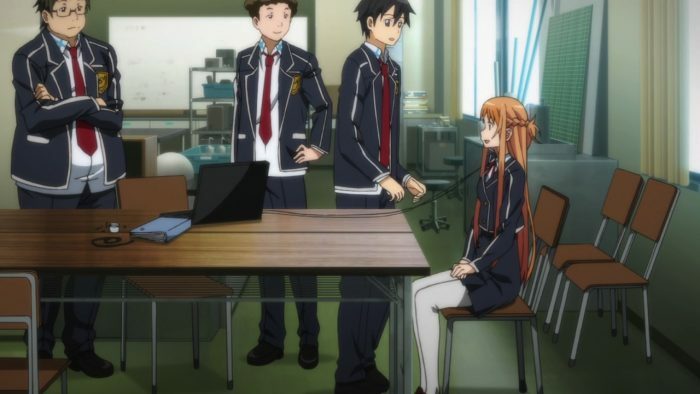 Perhaps because Asuna’s school is a special school for children trapped in SAO incident. So everyone inside would have better acceptance to the use of technology to be in a place other than the actual location of our physical body, similar to the concept of full-dive MMORPG. 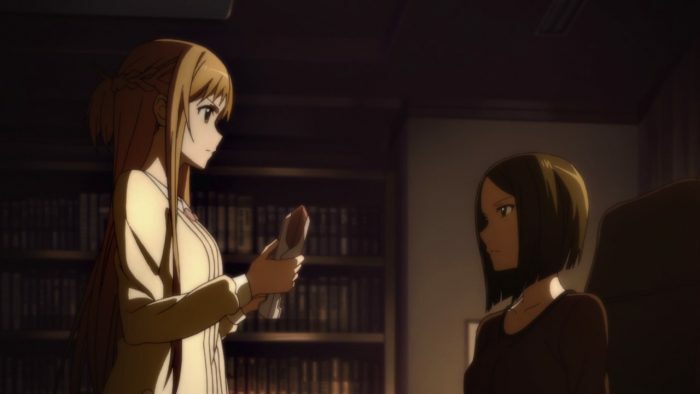 Thanks to heart-to-heart conversation with Yuuki, Asuna gathers her courage to tell her mother about her feeling (on the issue of moving to a different school back from few episodes ago). 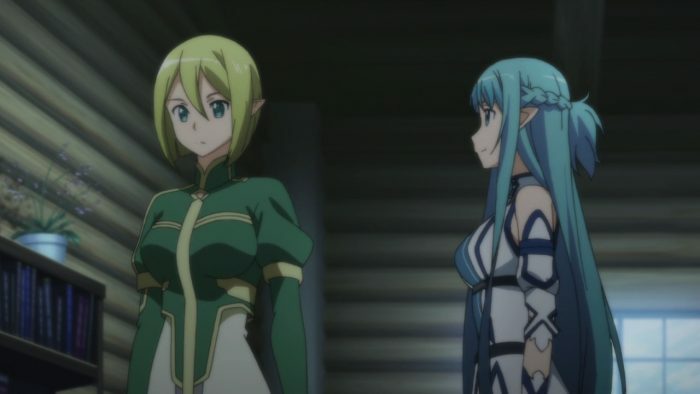 Asuna’s way to “talk” to her mother is through asking her to meet in virtual world. 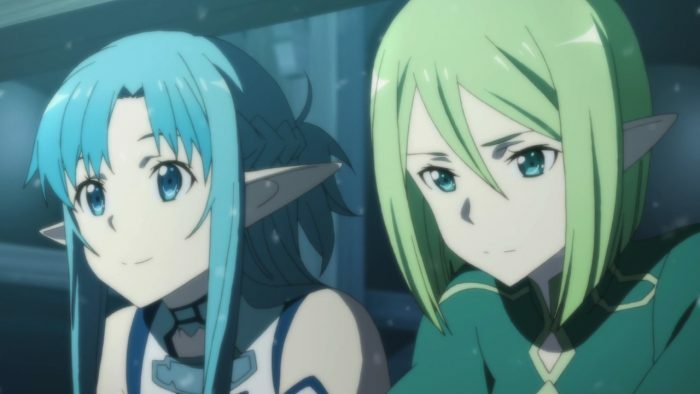 So we have mother and daughter scene in ALO avatars, in Asuna and Kirito’s home in Alfheim. 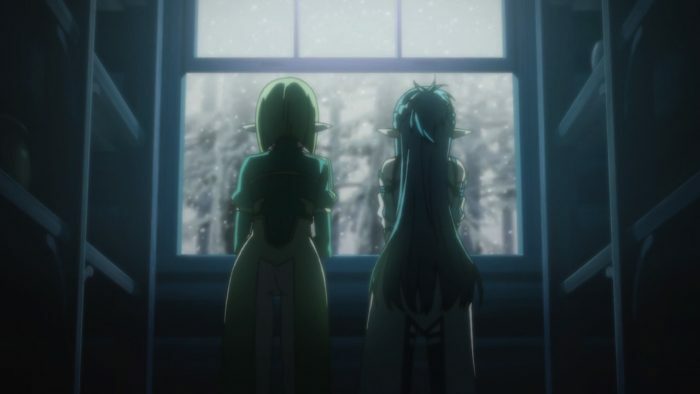 Asuna shows her mom a scene through the window that remind them of Asuna’s grandparents (her mom’s parents), then brings her mom back to the memory of her mom’s childhood time. 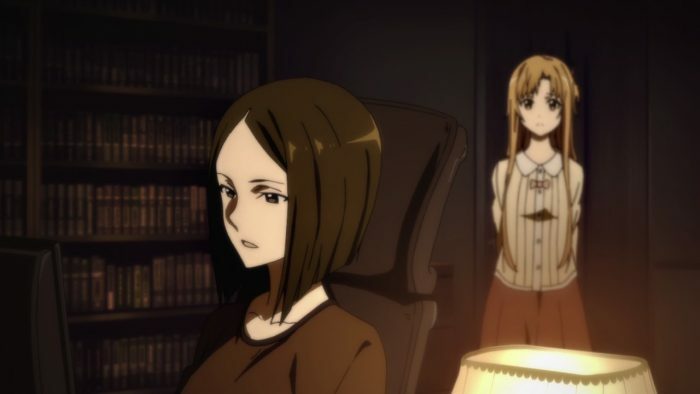 As a result, her mom finally decide that Asuna can stay in her current school, in the condition that she must improve her grades. Sounds more than fair to me. That’s the kind of thing that parents can (and should) expect from their kids. It’s part of parenting. I’m glad that Asuna has her real-life problem solved. 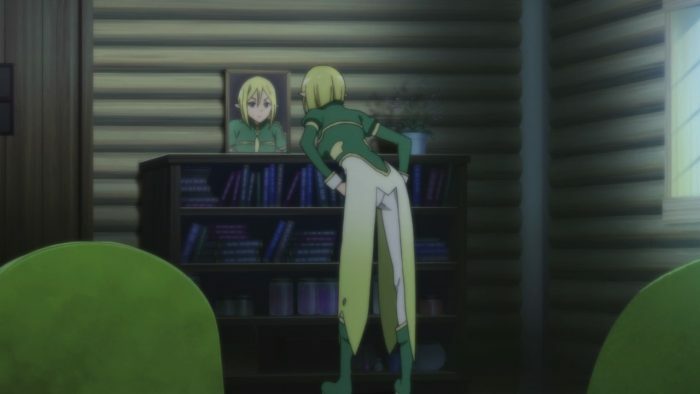 This is not the kind of “solving” I initially imagined when I first saw Asuna’s mom’s behavior few episodes back, but this is certainly a good way to have it resolved. One more episode to go. As much as I tried not to think about it, there is a very high chance that this season will not end with happy ending. I mean, AIDS is not a medically-curable illness, at least by today’s standard. And Asuna’s conversation with Yuuki’s doctor has made it clear that Yuuki’s illness is terminal. So I would anticipate a farewell episode to close this season. Hopefully we get a good one. Or, just a tiny bit of hope remains that Yuuki might magically survive. I mean, this is a work of fiction, so who knows? People who read the novel would surely know how this arc will end. I choose not to read the novel and enjoy every episode with surprise factor.